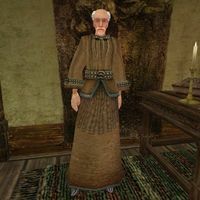 Socucius Ergalla, a Breton agent, is the chief agent of the Seyda Neen Census and Excise Office. In addition to helping you at the beginning of the game to select your character's class and determine which sign your character is born under, Socucius provides you with your release papers, which you must give to Sellus Gravius before you can leave. Socucius is also interested in the whereabouts of a missing tax collector, Processus Vitellius, and will offer medium training in Acrobatics, Light Armor, and Sneak. He wears a common robe and shoes. He also carries a small amount of gold and a steel shardblade with him. Aside from his natural bonus and resistance to magicka, and his ability to shield himself for short periods, the only spell he knows is Crying Eye. Death of a Taxman: Investigate the murder of a tax collector in Seyda Neen. "Take your papers off the table and go see Captain Gravius." Imperial Legion: "The Imperial legion provides security for the Census and Excise Offices here in Seyda Neen. The troopers you see here are assigned to guard duty here. And the troopers outside, in Seyda Neen, they're guards -- officers of the law." Law in Morrowind: "Theft, Trespass, Assault, Foul Murder, and Contempt are serious crimes; criminals pay compensation or serve sentences of punitive labor. If you commit a crime, turn yourself in to any guard and pay your fine. Here in Seyda Neen the guards are all Imperial legion troopers. In other towns, they may be local Great House guards." Morrowind: "Yes. This is Morrowind. You're in the Census and Excise Offices in the port of Seyda Neen, in Vvardenfell District of the province of Morrowind." As with numerous other NPCs, Socucius' face is not included as a choice in character creation. This page was last modified on 29 March 2019, at 08:50.